Looks good. An advice for reproducing this style in the key? If you give a plot a blank title it won’t show up in the key, but if you give it a title that’s a single space character it’ll show up. Setting the key spacing to -1 will overlay the two key entries, which will achieve what we want. This will only work for a single key entry, and for a vertically spaced key (though there’s no difference between horizontal and vertical spacing with a single entry). Lovely, thanks for the writeup. line 31: Unrecognized option. See ‘help set’. I can’t figure out what wrong! Maybe your gnuplot version is to old. Can you check what version you are running? Is there a possibility to use this style with overlapping curves (see http://postimg.org/image/3thtv0gxx/) without “cutting” the other curves? 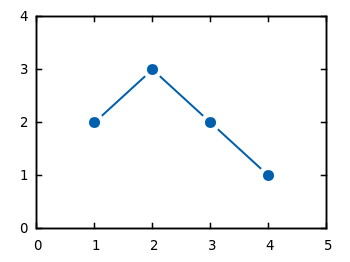 I have tried to find a similar line style in other plotting tools (pgfplots and matplotlib), but I couldn’t find a similar representation. Hi Hagen, I’ve tried this using the aqua terminal but it doesn’t seem to work. Is this purely because of the terminal or can I turn some settings when setting aqua (i.e. setting `dashed` for dashed lines, since it is not default)? Thanks!